This article is about the architectural construct. For other uses of arch or arches, see Arch (disambiguation). An arch is a vertical curved structure that spans an elevated space and may or may not support the weight above it, or in case of a horizontal arch like an arch dam, the hydrostatic pressure against it. Arches may be synonymous with vaults, but a vault may be distinguished as a continuous arch forming a roof. Arches appeared as early as the 2nd millennium BC in Mesopotamian brick architecture, and their systematic use started with the ancient Romans, who were the first to apply the technique to a wide range of structures. An arch is a soft compression form. It can span a large area by resolving forces into compressive stresses and, in turn eliminating tensile stresses. This is sometimes referred to as arch action. As the forces in the arch are carried to the ground, the arch will push outward at the base, called thrust. As the rise, or height of the arch decreases, the outward thrust increases. In order to maintain arch action and prevent the arch from collapsing, the thrust needs to be restrained, either with internal ties or external bracing, such as abutments. The most common true arch configurations are the fixed arch, the two-hinged arch, and the three-hinged arch. The fixed arch is most often used in reinforced concrete bridge and tunnel construction, where the spans are short. Because it is subject to additional internal stress caused by thermal expansion and contraction, this type of arch is considered to be statically indeterminate. The two-hinged arch is most often used to bridge long spans. This type of arch has pinned connections at the base. Unlike the fixed arch, the pinned base is able to rotate, allowing the structure to move freely and compensate for the thermal expansion and contraction caused by changes in outdoor temperature. However, this can result in additional stresses, so the two-hinged arch is also statically indeterminate, although not to the degree of the fixed arch. The three-hinged arch is not only hinged at its base, like the two-hinged arch, but at the mid-span as well. The additional connection at the mid-span allows the three-hinged arch to move in two opposite directions and compensate for any expansion and contraction. This type of arch is thus not subject to additional stress caused by thermal change. The three-hinged arch is therefore said to be statically determinate. It is most often used for medium-span structures, such as large building roofs. Another advantage of the three-hinged arch is that the pinned bases are more easily developed than fixed ones, allowing for shallow, bearing-type foundations in medium-span structures. In the three-hinged arch, "thermal expansion and contraction of the arch will cause vertical movements at the peak pin joint but will have no appreciable effect on the bases," further simplifying the foundation design. Arches have many forms, but all fall into three basic categories: circular, pointed, and parabolic. Arches can also be configured to produce vaults and arcades. Arches with a circular form, also referred to as rounded arches, were commonly employed by the builders of ancient, heavy masonry arches. 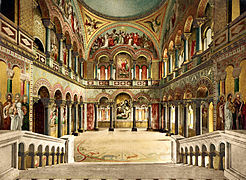 Ancient Roman builders relied heavily on the rounded arch to span large, open areas. Several rounded arches placed in-line, end-to-end, form an arcade, such as the Roman aqueduct. Pointed arches were most often used by builders of Gothic-style architecture. The advantage to using a pointed arch, rather than a circular one, is that the arch action produces less thrust at the base. This innovation allowed for taller and more closely spaced openings, typical of Gothic architecture. Vaults are essentially "adjacent arches [that] are assembled side by side." If vaults intersect, complex forms are produced with the intersections. The forms, along with the "strongly expressed ribs at the vault intersections, were dominant architectural features of Gothic cathedrals." The parabolic arch employs the principle that when weight is uniformly applied to an arch, the internal compression resulting from that weight will follow a parabolic profile. Of all arch types, the parabolic arch produces the most thrust at the base, but can span the largest areas. It is commonly used in bridge design, where long spans are needed. The catenary arch has a shape different from the parabolic curve. The shape of the curve traced by a loose span of chain or rope, the catenary is the structurally ideal shape for a freestanding arch of constant thickness. True arches, as opposed to corbel arches, were known by a number of civilizations in the ancient Near East and the Levant, but their use was infrequent and mostly confined to underground structures, such as drains where the problem of lateral thrust is greatly diminished. An example of the latter would be the Nippur Arch. Rare exceptions are an arched mudbrick home doorway in circa 2000BC Tell Taya and the Bronze Age arched Canaanite city gate of Ashkelon in modern-day Israel, dating to c. 1850 B.C. An early example of a voussoir arch appears in the Greek Rhodes Footbridge. Corbel arches were found in other parts of ancient Asia, Africa, Europe and the Americas. In 2010, a robot discovered a long arch-roofed passageway underneath the Pyramid of Quetzalcoatl, which stands in the ancient city of Teotihuacan north of Mexico City, dated to around 200 AD. In ancient Persia, the Achaemenid Empire built small barrel vaults (essentially a series of arches built together to form a hall) known as iwan, which became massive, monumental structures during the later Parthian Empire. This architectural tradition was continued by the Sasanian Empire, which built the Taq Kasra at Ctesiphon in the 6th century, the largest free-standing vault until modern times. The Romans were the first builders in Europe, perhaps the first in the world, to fully appreciate the advantages of the arch, the vault and the dome. Throughout the Roman empire, their engineers erected arch structures such as bridges, aqueducts, and gates. They also introduced the triumphal arch as a military monument. Vaults began to be used for roofing large interior spaces such as halls and temples, a function that was also assumed by domed structures from the 1st century BC onwards. The segmental arch was first built by the Romans who realized that an arch in a bridge did not have to be a semicircle, such as in Alconétar Bridge or Ponte San Lorenzo. They were also routinely used in house construction, as in Ostia Antica (see picture). In ancient China, most architecture was wooden, including the few known arch bridges from literature and one artistic depiction in stone-carved relief. Therefore, the only surviving examples of architecture from the Han Dynasty (202 BC – 220 AD) are rammed earth defensive walls and towers, ceramic roof tiles from no longer existent wooden buildings, stone gate towers, and underground brick tombs that, although featuring vaults, domes, and archways, were built with the support of the earth and were not free-standing. China's oldest surviving stone arch bridge is the Anji Bridge, built between 595 and 605 during the Sui Dynasty; it is the oldest open-spandrel segmental arch bridge in stone. However, the ancient Romans had virtually all of these components beforehand; for example, Trajan's Bridge had open spandrels built in wood on stone pillars. The first example of an early Gothic arch in Europe is in Sicily in the Greek fortifications of Gela. The semicircular arch was followed in Europe by the pointed Gothic arch or ogive, whose centreline more closely follows the forces of compression and which is therefore stronger. The semicircular arch can be flattened to make an elliptical arch, as in the Ponte Santa Trinita. Parabolic arches were introduced in construction by the Spanish architect Antoni Gaudí, who admired the structural system of the Gothic style, but for the buttresses, which he termed "architectural crutches". 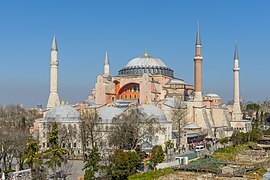 The first examples of the pointed arch in the European architecture are in Sicily and date back to the Arab-Norman period. The horseshoe arch is based on the semicircular arch, but its lower ends are extended further round the circle until they start to converge. The first known built horseshoe arches are from the Kingdom of Aksum in modern-day Ethiopia and Eritrea, dating from ca. 3rd–4th century. This is around the same time as the earliest contemporary examples in Roman Syria, suggesting either an Aksumite or Syrian origin for the type. In India, Bhitargaon temple (450 AD) and Mahabodhi temple (7th century AD) built in by Gupta Dynasty are the earliest surviving examples of the use of voussoir arch vault system in India. The earlier uses semicircular arch, while the later contains examples of both gothic style pointed arch and semicircular arches. Although introduced in the 5th century, arches didn't gain prominence in the Indian architecture until 12th century after Islamic conquest. The Gupta era arch vault system was later used extensively in Burmese Buddhist temples in Pyu and Bagan in 11th and 12th centuries. Since it is a pure compression form, the arch is useful because many building materials, including stone and unreinforced concrete, can resist compression, but are weak when tensile stress is applied to them. An arch is held in place by the weight of all of its members, making construction problematic. One answer is to build a frame (historically, of wood) which exactly follows the form of the underside of the arch. This is known as a centre or centring. Voussoirs are laid on it until the arch is complete and self-supporting. For an arch higher than head height, scaffolding would be required, so it could be combined with the arch support. Arches may fall when the frame is removed if design or construction has been faulty. The first attempt at the A85 bridge at Dalmally, Scotland suffered this fate, in the 1940s. 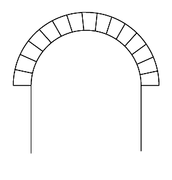 The interior and lower line or curve of an arch is known as the intrados. Old arches sometimes need reinforcement due to decay of the keystones, forming what is known as bald arch. In reinforced concrete construction, the principle of the arch is used so as to benefit from the concrete's strength in resisting compressive stress. Where any other form of stress is raised, such as tensile or torsional stress, it has to be resisted by carefully placed reinforcement rods or fibres. A blind arch is an arch infilled with solid construction so it cannot function as a window, door, or passageway. A special form of the arch is the triumphal arch, usually built to celebrate a victory in war. A famous example is the Arc de Triomphe in Paris, France. 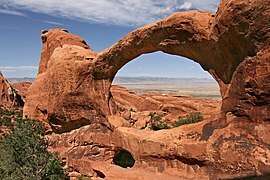 Rock formations may form natural arches through erosion, rather than being carved or constructed. Structures such as this can be found in Arches National Park. Some rock balance sculptures are in the form of an arch. The arches of the foot support the weight of the human body. ^ "Ancient Mesopotamia: Architecture". The Oriental Institute of the University of Chicago. Archived from the original on 16 May 2012. Retrieved 16 May 2012. ^ Vaidyanathan, R (2004). Structural Analysis, Volume 2. US: Laxmi Publications. p. 127. ISBN 978-81-7008-584-3 – via Google Books. ^ Ambrose, James (2012). Building Structures. Hoboken, NJ: John Wiley & Sons, Inc. p. 30. ^ a b c d e f Ambrose, James (2012). Building Structures. Hoboken, NJ: John Wiley & Sons, Inc. p. 31. ISBN 978-0-470-54260-6. ^ a b Reynolds, Charles E (2008). Reynolds's Reinforced Concrete Designer's Handbook. New York: Psychology Press. p. 41. ISBN 978-0-419-25820-9 – via Google Books. ^ Luebkeman, Chris H. "Support and Connection Types". MIT.edu Architectonics: The Science of Architecture. MIT.edu. Archived from the original on 28 October 2012. Retrieved 3 February 2013. ^ a b c Ambrose, James (2012). Building Structures. Hoboken, NJ: John Wiley & Sons, Inc. p. 32. ISBN 978-0-470-54260-6. ^ Oleson, John (2008). The Oxford Handbook of Engineering and Technology in the Classical World. US: Oxford University Press. p. 299. ISBN 978-0-19-518731-1. ^ Crossley, Paul (2000). Gothic Architecture. New Haven, CT: Yale University Press. p. 58. ISBN 978-0-300-08799-4 – via Google Books. ^ Hadrovic, Ahmet (2009). Structural Systems in Architecture. On Demand Publishing. p. 289. ISBN 978-1-4392-5944-3. ^ MHHE. "Structural Systems in Architecture". MHHE.com. Archived from the original on 13 March 2013. Retrieved 3 February 2013. ^ Lefkovits, Etgar (8 April 2008). "Oldest arched gate in the world restored". Jerusalem: The Jerusalem Post. Archived from the original on 14 August 2013. Retrieved 21 January 2018. ^ Reade, J.E. (1 January 1968). "Tell Taya (1967): Summary Report". Iraq. 30 (2): 234–264. doi:10.2307/4199854. JSTOR 10.2307/4199854. ^ Jorge Barrera (12 November 2010). "Teotihuacan ruins explored by a robot, AP report in the Christian Science Monitor, 12 November 2010". Christian Science Monitor. Archived from the original on 11 May 2013. Retrieved 2013-06-08. ^ Brosius, Maria (2006), The Persians: An Introduction, London & New York: Routledge, p. 128, ISBN 0-415-32089-5. ^ Garthwaite, Gene Ralph (2005), The Persians, Oxford & Carlton: Blackwell Publishing, Ltd., p. 84, ISBN 1-55786-860-3. ^ Schlumberger, Daniel (1983), "Parthian Art", in Yarshater, Ehsan, Cambridge History of Iran, 3.2, London & New York: Cambridge University Press, p. 1049, ISBN 0-521-20092-X. ^ Needham, Joseph (1986), Science and Civilization in China: Volume 4, Physics and Physical Technology, Part 3, Civil Engineering and Nautics, Taipei: Caves Books, pp. 161–188, ISBN 0-521-07060-0. ^ Needham, Joseph (1986), Science and Civilisation in China: Volume 4, Physics and Physical Technology; Part 2, Mechanical Engineering, Taipei: Caves Books, pp. 171–172 ISBN 0-521-05803-1. ^ Liu, Xujie (2002), "The Qin and Han dynasties", in Steinhardt, Nancy S., Chinese Architecture, New Haven: Yale University Press, p. 56, ISBN 0-300-09559-7. ^ Wang, Zhongshu (1982), Han Civilization, translated by K.C. Chang and Collaborators, New Haven and London: Yale University Press, pp. 1, 30, 39–40, ISBN 0-300-02723-0. ^ Chang, Chun-shu (2007), The Rise of the Chinese Empire: Volume II; Frontier, Immigration, & Empire in Han China, 130 B.C. – A.D. 157, Ann Arbor: University of Michigan Press, pp. 91–92, ISBN 0-472-11534-0. ^ Morton, William Scott; Lewis, Charlton M. (2005), China: Its History and Culture (Fourth ed. ), New York City: McGraw-Hill, p. 56, ISBN 0-07-141279-4. ^ Liu, Xujie (2002), "The Qin and Han dynasties", in Steinhardt, Nancy S., Chinese Architecture, New Haven: Yale University Press, p. 55, ISBN 0-300-09559-7. ^ Steinhardt, Nancy Shatzman (2005), "Pleasure tower model", in Richard, Naomi Noble, Recarving China's Past: Art, Archaeology, and Architecture of the 'Wu Family Shrines, New Haven and London: Yale University Press and Princeton University Art Museum, pp. 279–280, ISBN 0-300-10797-8. ^ Wang, Zhongshu (1982), Han Civilization, translated by K.C. Chang and Collaborators, New Haven and London: Yale University Press, pp. 175–178, ISBN 0-300-02723-0. ^ Watson, William (2000), The Arts of China to AD 900, New Haven: Yale University Press, p. 108, ISBN 0-300-08284-3. ^ Needham, Joseph. The Shorter Science and Civilisation in China. Cambridge University Press, 1994. ISBN 0-521-29286-7. pp. 145–147. ^ This title strictly applies only to the sum of attributes given (O’Connor, Colin: Roman Bridges, Cambridge University Press 1993, ISBN 0-521-39326-4, p. 171): Various Roman stone pillar bridges featured wooden open-spandrel segmental arches as early as the 2nd century CE, among them Trajan's bridge, the longest bridge of the world to have been built for over a thousand years. Also, a dozen or more Roman close-spandrel stone segmental arch bridges are known from the 1st century BC onwards, such as the Ponte San Lorenzo (Padua), Alconétar Bridge and the Makestos Bridge (Turkey), the last having half-open spandrels. The 27 segmental arches of the Bridge at Limyra (300 ce) feature span to rise ratios between 5.3 and 6.5 to 1, making it an earlier example of a stone quarter circle segmental arch bridge. This leaves the Anji bridge the title of "the oldest open-spandrel stone quarter circle segmental arch bridge in the world". ^ Chihara, Daigorō (1996). Hindu-Buddhist Architecture in Southeast Asia. Brill. ISBN 978-90-04-10512-6. Archived from the original on 2 July 2018. Retrieved 1 April 2018 – via Google Books. ^ Le, Huu Phuoc (2010). Buddhist Architecture. Grafikol. ISBN 978-0-9844043-0-8. Archived from the original on 2 April 2018 – via Google Books. ^ Reid, Esmond (1984). Understanding Buildings: A Multidisciplinary Approach. Cambridge, MA: MIT Press. p. 12. ISBN 978-0-262-68054-7. Archived from the original on 2 June 2016. ^ Allen, Edward (2009). Fundamentals of Building Construction. Hoboken, NJ: John Wiley & Sons. p. 529. ISBN 978-0-470-07468-8. ^ Davies, David (2014). Cambridge IGCSE Geography Revision Guide Student's Book. Cambridge University Press. ISBN 978-1-107-67482-0 – via Google Books. ^ "Casa-Museo Simón Bolívar". Havana Guide. lahabana.com. 22 December 2013. Archived from the original on 2 July 2018. Retrieved 2 July 2018. Roth, Leland M (1993). Understanding Architecture: Its Elements History and Meaning. Oxford, UK: Westview Press. pp. 27–28. ISBN 978-0-06-430158-9. Wikimedia Commons has media related to Arch. Wikimedia Commons has media related to Arches. Paper about the three-hinged arch of the Galerie des Machines of 1889 Whitten by Javier Estévez Cimadevila & Isaac López César.